At Restore SD Plastic Surgery, we believe in science and have reviewed the studies behind Skinade®. In addition to powerful study results, our whole team tried it for 30 days. And…. we loved it! Not only does it taste great, but everyone noticed significant improvement in the quality, texture, and tone of their skin. Combined with a medical grade skin care regimen, Dermal Infusion treatments, and Microneedling or laser resurfacing, looking younger and more refreshed just got easier! Why taking care of your skin is important? Skin is the largest organ in the human body and as it is exposed to environmental stress, it is the most telltale indicator of our age and lifestyle. There are so many year-around outdoor activities in San Diego, that it is nearly impossible not to acquire some skin damage from the sun, surf, or wind. Fine lines, wrinkles, sagging skin and loss of youthful plumpness, combined with a natural decline in the body’s ability to regenerate new cells, are all visible signs of aging. Environmental aggressors such as UV rays, cold and pollution cause dull, rough, dry skin and contribute to the formation of fine lines and wrinkles. Skinade® is a multi-award winning, natural peach and mangosteen flavored anti-aging collagen drink containing a patent pending formulation of active ingredients that boosts your body’s natural production of collagen and hyaluronic acid. Skinade® is a drink that works from the inside out. Its six active ingredients work synergistically to promote optimal skin function. As a liquid supplement, its innovative formulation is highly bio-available, meaning that the body can absorb and make use of a higher proportion of the active nutrients. The active ingredient in Skinade® are 100% in solution, allowing for an absorption rate of 95%- a level that can never be matched by tablets, or powders suspended in solution. The collagen matrix is responsible for skin support, firmness, elasticity, hydration and the constant production of new skin cells. The more collagen you have, the healthier, elastic and supple your skin is and the more youthful it appears. Alarmingly, we lose 1.5% of the collagen in our skin each year after the age of 20. This loss results in skin aging, including wrinkles, fine lines, dry, blemished and thinning skin. Alongside the reduction in your body’s ability to produce new collagen, the aging process results in damage to the existing collagen matrix, which becomes fragmented and broken. In older skin, collapsed fibroblasts produce low levels of collagen and high levels of collagen-degrading enzymes that further damage the proteins forming the collagen matrix. This is a continuous, self-destructive cycle that accelerates the aging process. Studies have concluded that treatments which stimulate the proliferation of new, non-fragmented collagen can provide substantial improvement to the appearance and health of aged skin. Maintaining the health and structure of the collagen matrix is key to targeting these skin concerns and can dramatically improve the skin’s youthful, healthy appearance. Studies show that the most effective way to maintain the collagen matrix is to boost the body’s own production of collagen by ingesting collagen peptides. Skinade’s® advanced anti-aging formula stimulates the production of new, undamaged collagen. Fibroblasts can attach themselves to this new collagen structures and this, in turn, balances the body’s own natural collagen synthesis, reversing the self-destructive aging process. Drinking Skinade® stimulates the body’s own natural collagen production. When the body senses collagen in the blood stream, it stimulates the proliferation of fibroblasts reinforcing the collagen matrix and playing a critical role in wound healing. 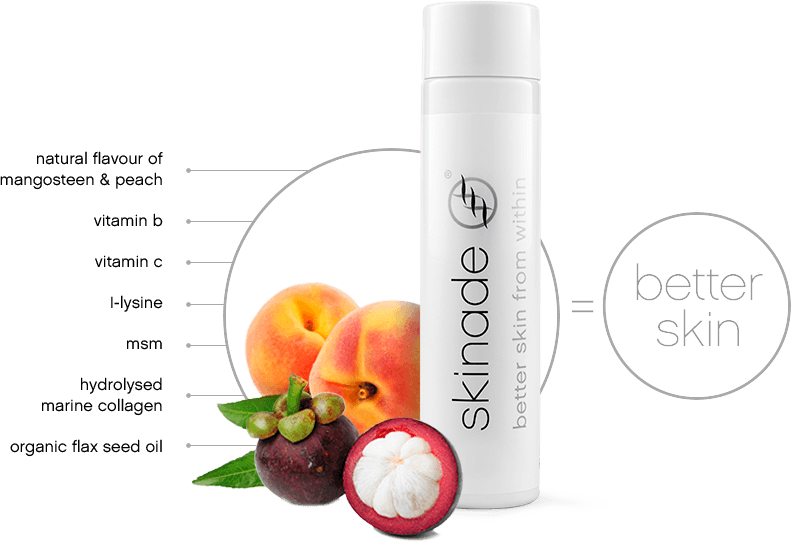 Skinade® delivers essential micronutrients in liquid form and helps to re-build the collagen matrix in your skin. Skinade® combats the signs of aging by reducing oxidative stress, preventing cross linking of collagen fibers, increasing moisture and hydration thus increasing natural hyaluronic acid production within the dermal layer of the skin. As a result, Skinade® restores your skin’s youthful appearance, improves tone, texture, hydration, smooths fine lines and improves skin suppleness. For Skinade® to be effective, it needs to become part of your skincare regime. For best results, we recommend that you drink one bottle each day. We would advise avoiding caffeine 1hr each side of taking Skinade® as caffeine can hinder the absorption of the essential micro-nutrients and collagen. If you need an afternoon pick-me-up, the B vitamins in Skinade® will give you a natural energy boost making afternoon the perfect time to drink it. Skinade® does not contain bovine or porcine products, hormones, genetically modified organisms, alcohol, added sugar, artificial flavors or artificial colors. Skinade® is free from lactose, gluten and dairy and has only 2 grams of carbohydrates per bottle. Skinade® is shelf-stable and does not need to be refrigerated, but it tastes even better chilled. Skinade® comes in two versions: a ready-mixed 150ml bottle and a TSA friendly 15ml travel sachet. Both products have the same efficacy.